For Trektember, we’re covering three episodes out of season two: The Measure of a Man, Q Who, and Peak Performance, all frequently listed as favorites on many lists of the year’s best entries. Two of them frequent Top Tens for the entire series. Others regularly ranked high are the Sherlock Holmes-themed holodeck adventure Elementary, Dear Data; Contagion, an adventure episode involving a seeming disease afflicting starships; a sci-fi puzzle story, Time Squared; and two Klingon themed episodes: The Emissary and A Matter of Honor. Where Silence Has Lease is among the season’s ‘underrated’ episodes. Not everyone loves it, but those who do find it pretty compelling: the Enterprise truly encounters a new life form. It has some similarities with TOS’s The Immunity Syndrome, but they’re minimal. It really is its own thing, very well directed and worth a look. Despite the writers’ strike, some of the episodes shined in just this area. 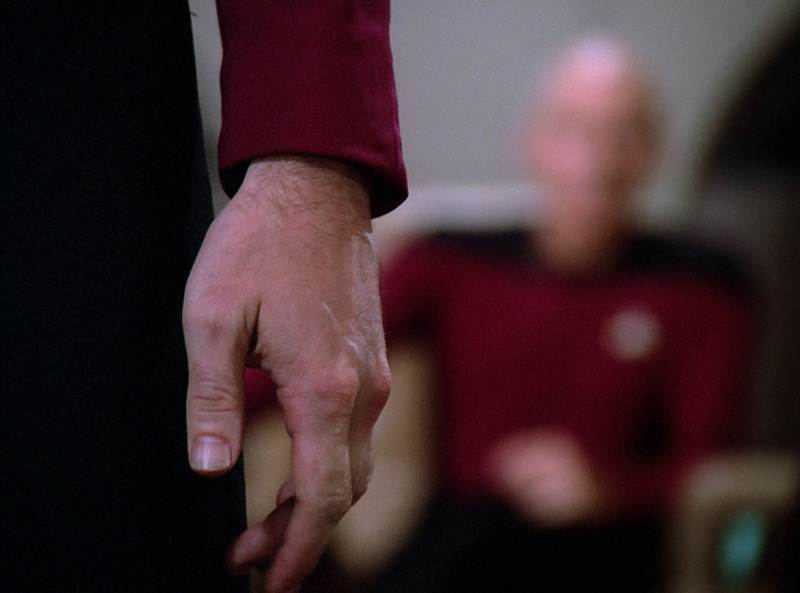 Melinda Snodgrass came aboard the writing team via her script for “The Measure of a Man,” which many would place as TNG’s absolute epoch just on dialogue. She had been an unhappy lawyer who turned into a happy novelist. A writer friend of hers, some guy named George R. R. Martin, suggested she write an episode of The Next Generation, which he would have his agent pass to them. Not only did they like it and buy it, they also made her a staff writer immediately upon meeting her. She would remain through the end of season three. Other elements of writing, structure and development, had high points; notably in the episode I was fortunate enough to be assigned, Q Who, in which we are treated to rich unusualities of the kind that bring delight rather than frustration. I think that has its seed in the initial goal. As producer Peter Lauritson explained, his producing colleague, “Maurice Hurley… felt that the series needed an unbeatable foe, so he came up with the Borg.” The whole creative team rose to enhance this story. For instance, to help construe the Borg as alien, the design team kicked in by thinking outside the sci-fi box. Art Director Michael Okuda points out in the episode’s audio commentary that while aerodynamics are unnecessary in space, most spaceships in Star Trek – in most of science fiction – have been designed aerodynamically. We’re used to seeing it now. 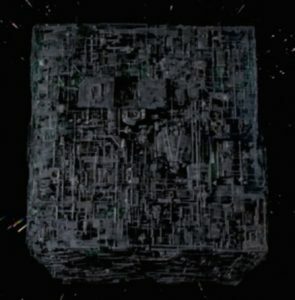 Not this one: A Borg ship is a cube. It looks like it’s made of pipes. It’s open, not sealed off. It’s perfectly logical, but just hadn’t been done before, so it was, you know, weird. I have more good to say about this one, but I put it in the profile piece. 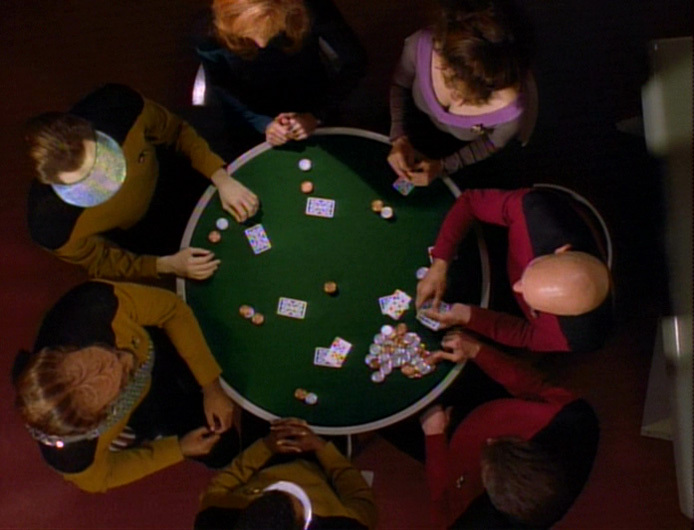 The senior staff’s regular poker game also started in season two. Said Lauritson, “It’s one of those things you try, and if it catches on, you build on it, and that lasted all the way to season 7.” These games frequented the episodes, with the occasional reminders that Captain Picard was always welcome to join, but never did until the final episode. The game was the subject of final scene in the whole series, even. 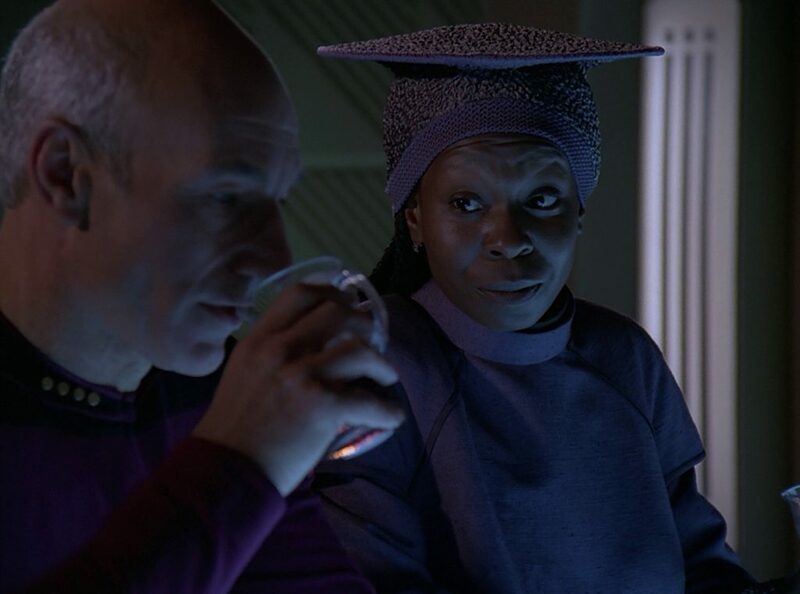 Another big plus was Whoopi Goldberg as the bartender character Guinan. Jonathan Frakes said of her, “She’s one of those actors that you can stay on her face and if she’s working, if she’s thinking, it – it’s not boring.” She would appear in five episodes of season two, then eight of each of the next three years. She wasn’t in season 7, even the final episode, but Guinan is probably the first character people would think of on a list of important non-leads in the series.